Marci Radin joined us to talk about her volunteer experiences with the Shadhika charity in India. Several years ago she was introduced to Shadhika by a physician colleague whose parents started this organization to support education and empowerment for girls in India, www.shadhika.org. They invite donors to visit India to observe the program's successes. Marci was so inspired by her visit to India that she returned, again and again. Her second trip was as volunteer teaching English as a second language and basic computer skills. She even retired from her job to make additional three-month journeys to volunteer as a teacher. There are over three million NGOs in India that provide services that the government lacks. She is connected to two organizations in Kolkata, India that support education and employment preparation: Shadhika and Uddami (http://uddami.org) is an organization that provides education, English, computers and work skills and job readiness. The school is available to poor students, for no charge. Marci shared photos and stories about the programs and the people who are part of her life in Kolkata. She plans to return again in December for three months. Next week President Janine will start a new 50/50 process. Watch for specifics! A Rotary Peak hike with Exchange Students will be August 4. The Hiwan Homestead and MRC will do a literacy program in Evergreen: August 4. Contact Janine if you would like to volunteer. Order peaches by August 13th. Click the peach right here to order online directly or you can order from our website. Pick up your peaches Friday August 24th in front of Luna's Mandala in Aspen Park Center, 25797 Conifer Rd., Conifer. PRINT A COPY OF YOUR PAYPAL RECEIPT AND BRING IT WHEN YOU PICK UP YOUR ORDER! Watch for the Sign up Genius to help with distribution. This Sunday from 10-2 the Club will have a family social event at Staunton State Park; it includes a guided historical hike of the property. We will meet at Davis Ponds; watch for the sign after you pass the entrance station. Bring you own beverage and a dish to share. August 1st, 5:30-8pm we will meet at Mad Jack’s to kick off the 285 Back Pack fund-raising. 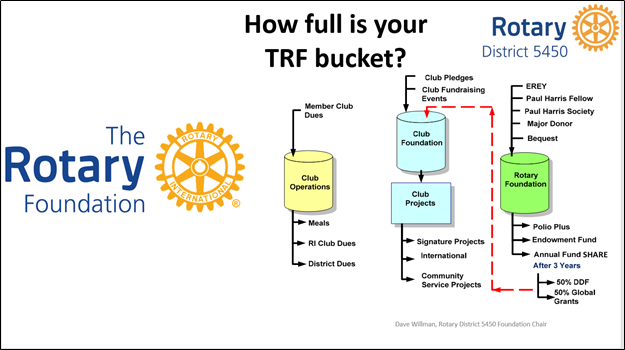 We need a Club member to participate in a webinar in order for us to qualify for District grants. The webinar will be 5:30-7:30—and can be done from home. There will also be a training this winter at Red Rocks Community College. In September, we will start a trial change of meeting schedule; information is on the front page of our website. Ed thanked members who helped with SummerFest in Evergreen last weekend; the event supports Evergreen Center for the Arts.